يقع في Jabiru, Kakadu Lodge إنه المكان الأنسب لاكتشاف كاكاداو و ما يحيطها. يقع مركز المدينة المثير على بعد فقط. سوف يعشق النزلاء موقع هذا الفندق، فهو قريب من أهم المعالم السياحية في المدينة كمثل كاكادو ناشيونال بارك . إن Kakadu Lodge حريص على توفير الراحة للنزلاء، فلا يوفر الموظفون جهداً في تقديم أفضل الخدمات وضمان حسن الاستقبال. إن مرافق مخصصة لذوي الاحتياجات الخاصة, تخزين الأمتعة, صف السيارات, غرفة عائلية, مرافق للشواء هي جزء فقط من الخدمات التي تميز Kakadu Lodge عن باقي الفنادق في المدينة. في Kakadu Lodge غرف نوم يزيد عددها عن 103 صممت بذوق وعناية لتوفر لك كل وسائل الراحة . بعضها يحتوي أضاً على غرف لغير المدخنين, مكيف هواء, مكتب, شرفة/ تراس, ساعة منبه. يمكنك طلب اللائحة الكاملة للخدمات في الفندق ومن بينها حمام سباحة خارجي, سبا, حديقة. إن Kakadu Lodge هو خيار ذكي بالنسبة للمسافرين إلى كاكاداو، بما يوفره من إقامة هادئة ومرحة. We enjoyed our stay here. Room was clean. Bed comfortable. Basic amenities available. Shared bathroom. Only part which to note is the noise the fridge makes and the way the air cond operates without a remote control. Or maybe the remote is missing from our room. Good location to set off for different activities around Kakadu. Lovely pool. Shared kitchen available. Hot showers. It was bad enough paying $160 for one night, but I expected at least a tap and basin in my room, if not to wash my hands in at least to be able to fill the kettle. My room certainly did not have a kitchenette and the room that was a kitchen that you could use did not even have HOT water. Shared bathroom was also very average. I did inform the staff that this small room certainly did not resemble any 'lodge' I have ever seen, but they were disinterested. Also at night there are not enough lights to provide a safe bath from the rooms to the swimming pool. Surely solar lights could be installed that would illuminate the path? We booked through Agoda and received excellent service from them when we had to cancel our last night and had our money refunded without any problems. We will use Agoda again. We stayed in a cabin at Kakadu Lodge while our family camped. It suited our purposes and was an excellent arrangement. 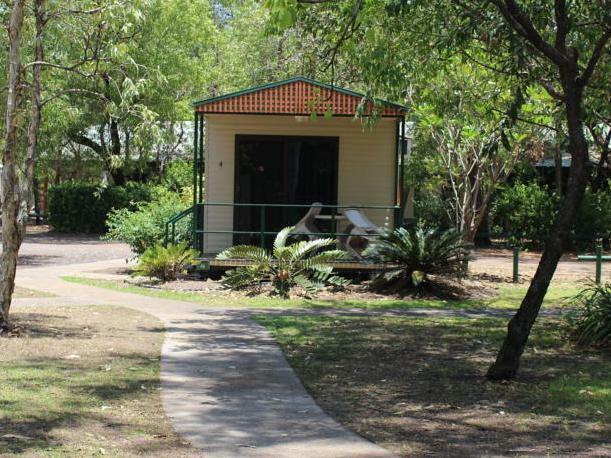 I stayed three night in the Studio Lodge and I think this is the best quality price solution for a comfort stay in the Kakadu Park (two rooms for more space, private bathroom, equipped kitchen). The restaurant is also really good. Stayed in a lodge room for 1 night - basically a functional, clean room with access to shared showers/toilets and kitchen facilities. OK value for money but don't expect too much. Good pool and reasonable bar/bistro for meals - there few options in Jabiru. Would recommend to others but with reservations. We stayed in a cabin, full facilities, you can cook if you want, everything you need is included, large room, can sleep 4. A bit old but all functional. Exceed our expectation. We rented 2 bedroom cottage. Very clean and comfortable. 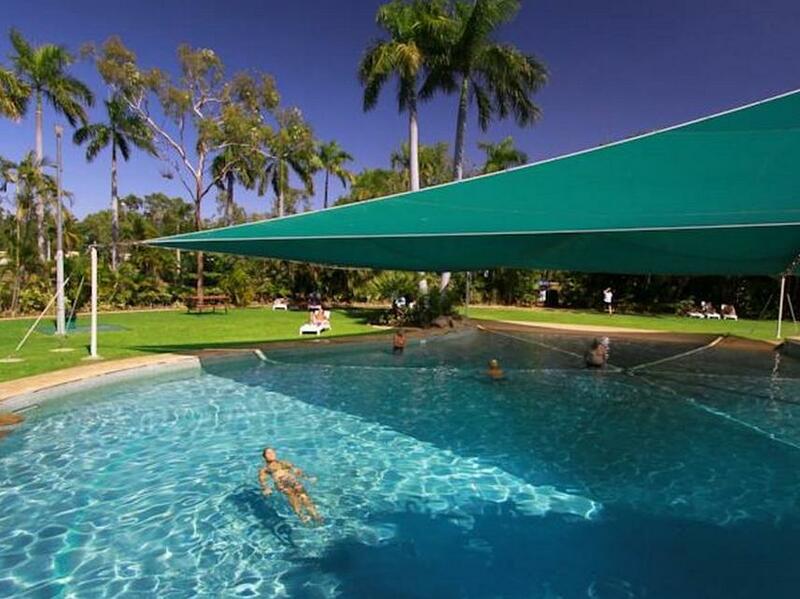 The pool is the highlight of the resort its big and vell maintained , being in NT they have it covered with canope to keep harsh sunlight away. Friendly staff all very helpful. Would surely recommend for a stay. The stay was ok as we were out most of the time. the room is really quite basic but it is clean. Unfortunately there were a big school group staying as well and the pool was filled with noisy kids/ teenagers. OUr stay was good. The Lodge is very clean and quiet although full, this is because they space their cabins well - no over crowding for this lodge. Have all facilities that you need and a great pool area. The food at their restuarant outstanding. I spent two nights in a basic room at the Lodge - utilising a shared bathroom/shower facility. It was a nice clean room, and was quiet. I would definitely stay again. I had dinner at the restaurant one night, and although the barman/host was a bit dismissive, the food was more than acceptable. open space, great pool, clean. We had a great time here. Everything was great. The only thing to pick on was the small bedroom we had in the cabin. It had 1 sml single right up against the wall and a bunk. The mattresses in that room had a plastic cover under the sheets and made it an uncomfortable sleep for my mother. Apart from that, everything else was good. Exactly what we were after for a 1 night stop over in Kakadu. We didn't spend much time in the room, just a quick swim & off again to the Yellow Waters sunset cruise, then back for dinner & bed. It had everything we needed, comfy beds, kettle, toaster, plates & cutlery & fridge for breakfast as there is no b/fast offered at the restaurant. The dinner we had by the pool was sensational - best meal of our trip to the NT. The only negative was that the sprinklers turned on at 3:30am and sprayed hard against the metal walls and woke us all up. I'd say it went for about an hour. Could've been timed better but didn't ruin our stay. I'd stay there again for sure. Stay 2 nights in a 1 bedroom cabin. It is fairly small and looking a bit tired. Could do with an upgrade especially for the price you are paying. It has a kitchen with basic utensils needed. The shower was tiny and I am a petite frame, as was the vanity. Strong smell of gas outside the cabin. The pool area was nice with a bar and restaurant​/cafe. We didn't have a meal there so can't comment on the food. Good place to base yourself for getting around Kakadu. Not much open in the shopping centre. Supermarket was well equipped and there was a newsagency. 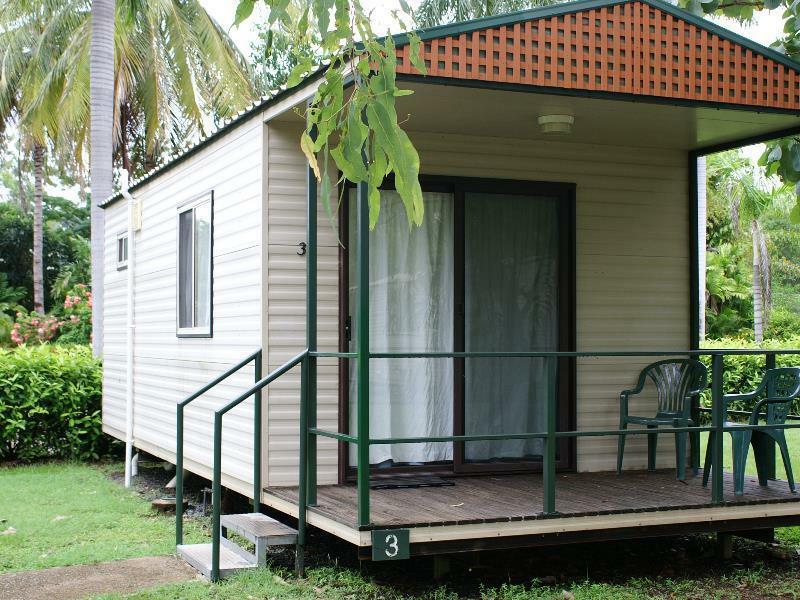 The cabin we stayed in was very over priced for the accommodation provided, but at the same time was some of the cheaper accommodation available in Kakadu National Park. The national park is great to visit, but the businesses and government seem focused on gouging ever dollar they can from tourists (it cost $60 for 2 seniors to enter the park). The restaurant at the park was adequate with meals on the expensive side but not outrageous. Overall could only be described as adequate. Lodge room was WAY TOO EXPENSIVE! No bathroom!!! 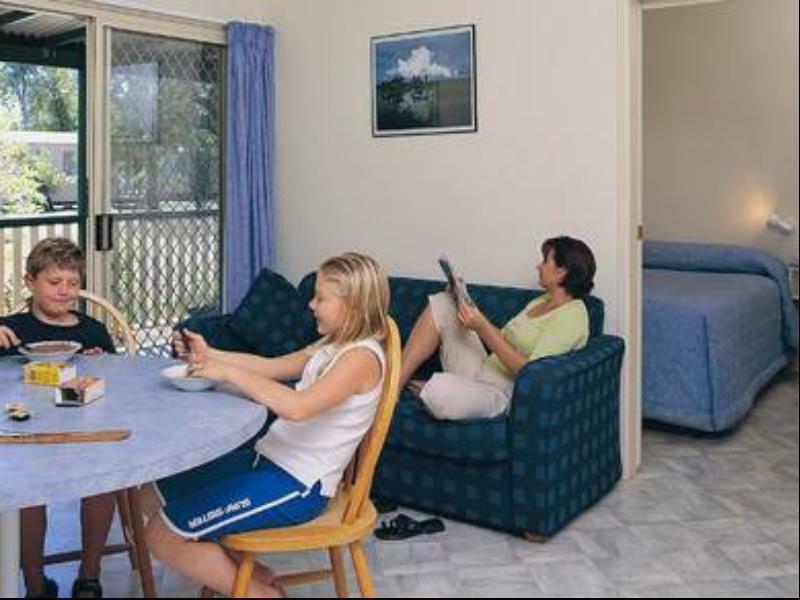 We are currently staying in very comfortable accommodation which is very clean, air conditioned and only $80.00 - with a bathroom!!! 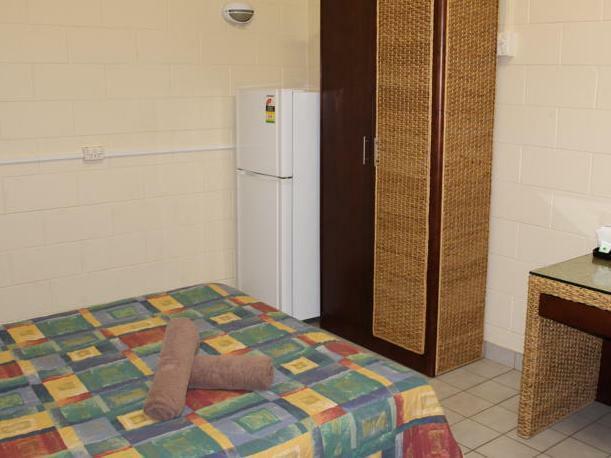 Kakadu Lodge need to review their pricing.